One only size extra small size 34" to 36" chest. ONE ONLY - EXCEPTIONAL VALUE! 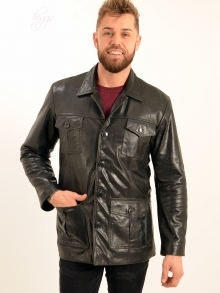 One only men's extra small Safari style men's Black leather jacket made from medium weight glazed Cowhide skins. Two full sized lower pockets with buttoned Leather flaps plus two smaller breast pockets also with buttoned Leather flaps. Two full wallet sized inner pockets (one with a zip) edged with leather. Button and buttonhole fastenings. Striped Black Polyester lining with soft internal Thermal lining for extra warmth. Jacket length approx. 31.5" (80 cm). ONE ONLY - SAVE £30! 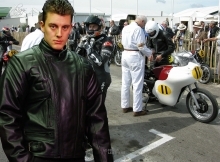 Men's black leather motorcycle jackets, made from heavy quality Cowhide, will give years of hard wear. Straight easy cut body and sleeves with leather epaulettes on the shoulders. Fastens with heavy weight silver zip and metal buckled belt and has zips on the sleeves at the wrists. Three outer pockets with zips, one outer ticket pocket with stud, one leather edged inner pocket. You can pay double this price or more elsewhere! Please note, these are heavy weight jackets, hence the higher overseas delivery charges, also delivery to some parts of Scotland, Channel Islands, Ireland and some other parts of the UK take approx. 3 days. Jacket length approx. 26.5" (67cm). SIZES UP TO 50" CHEST! LAST FEW - EXCEPTIONAL VALUE! 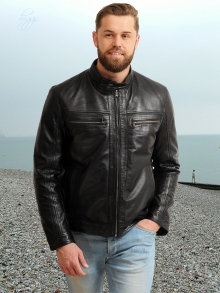 Fantastic value latest style Leather Biker jackets for men!! 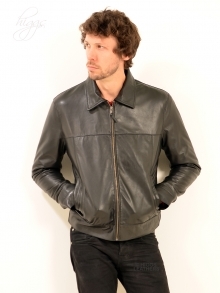 Men's Black Leather Biker jacket, made from soft quality Lamb Nappa skins. Straight cut body and sleeves with adjustable studded cuffs. Intricate let in narrow leather insert detail in the body, sleeves and collar. Small Granddad style collar fastens with a metal stud. Two full sized lower pockets with two higher breast pockets, all with metal zip fastenings. Two full wallet size inner pockets (one with a zip) edged with leather. Toning Polyester lining with soft internal Thermal interlining for extra warmth. A few also available in Antique Brown, picture and details to follow. 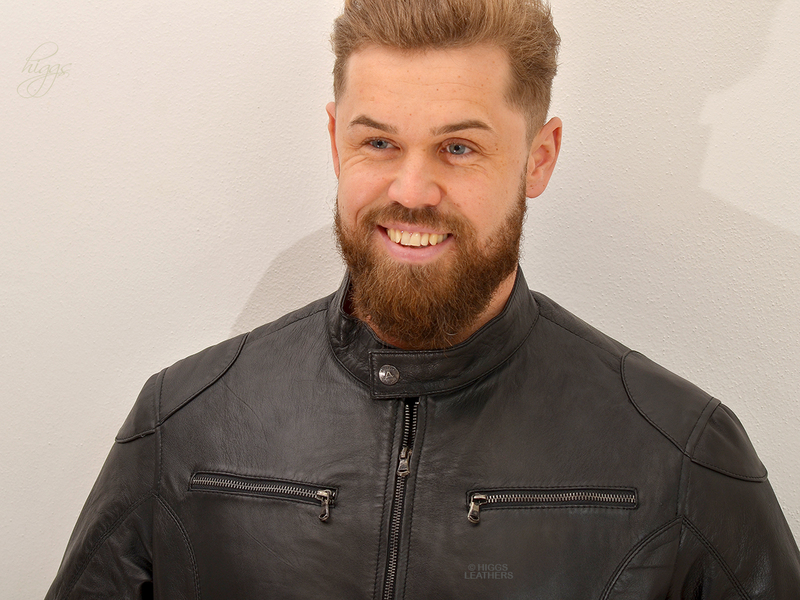 Please select your chest size34"36"50"
Super quality extra soft Antique Brown shade "Crushed" Lamb men's Leather hooded bomber jacket with "Rubbed" seams. The "Crushed" effect gives a fashionable creased look to the skins and the "Rubbed" seams give a "worn" look to the leather. Easy fit Bomber style body and sleeves finished with toning elasticated rib knit both at the waist and wrists, epaulets on shoulders. 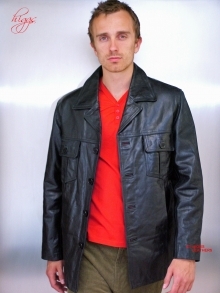 Small shirt style collar can be fastened high in the neck, detachable zip on leather hood. Two outer patch pockets with flaps that fasten with concealed metal studs plus two comfortable side entry pockets positioned behind them. Two leather edged full wallet sized inner pockets (one with a zip). 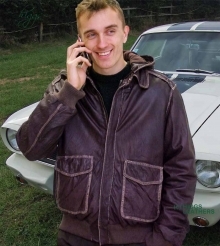 Contrasting light beige colour top stitching around the pockets, armholes, epaulets, front edges and hood, to emphasise the style of the jacket. Matt brown cotton lining in both the jacket and the hood. Fastens with a strong antique colour metal zip. 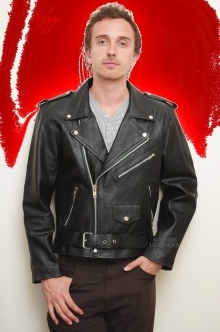 LEATHER JACKETS FOR MEN ON SALE! FEW ONLY AT THIS LOW PRICE! 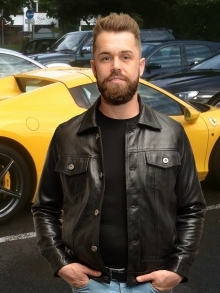 Mans shorter length 'Jeans' style Black Leather Biker jackets, made from soft quality Lamb Nappa skins. Small shirt style collar, shirt style sleeves with metal studs on cuffs. 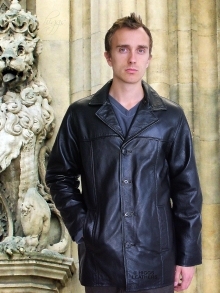 Two full size slanted outer pockets, two leather edged inner pockets (one with a zip). 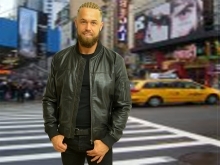 If you want a shorter length Black Leather jacket, without lots of fussy detail, these super jackets are the perfect choice! Jacket length approx. 25.5" (65 cm). 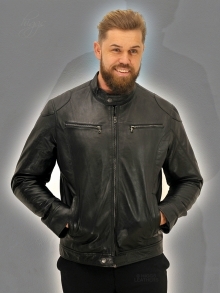 Heavy quality Buffalo mens black leather motorcycle jackets with extra heavy duty padding on elbows, shoulders and collar. 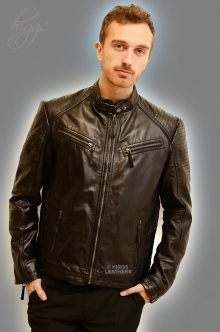 Body fastens with heavy weight black centre zip plus extra metal studs. Matching metal studs on the small high fastenibg collar. Straps with black metal buckles at each side to adjust the body fitting. Zips at end of sleeves to adjust tightness at wrists. Four outer pockets with zips plus one full wallet sized leather edged inner pocket. 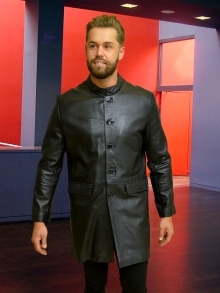 (Matching heavy duty leather trousers that can be attached with a zip at the back are also available, see picture below). Will give many, many years of good wear, at a price well under those selling elsewhere! Please note, these are heavy weight jackets, hence the higher overseas delivery charges, also delivery to some parts of Scotland, Channel Islands, Ireland and some other parts of the UK take approx. 3 days and the delivery cost will be double that shown below. Jacket length approx. 27" (69cm). Please select your chest size48"50"